Fighting for the Future of Food tells the story of how a small group of social activists, working together across tables, continents, and the Internet, took on the biotech industry and achieved stunning success. Rachel Schurman and William A. Munro detail how the anti-biotech movement managed to alter public perceptions about GMOs and close markets to such products. Drawing strength from an alternative worldview that sustained its members' sense of urgency and commitment, the anti-GMO movement exploited political opportunities created by the organization and culture of the biotechnology industry itself. Fighting for the Future of Food ultimately addresses society's understanding and trust (or mistrust) of technological innovation and the complexities of the global agricultural system that provides our food. Content Provided by Syndetics. 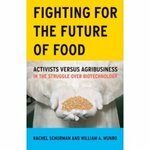 Munro, William A. and Schurman, Rachel, "Fighting for the Future of Food: Activists versus Agribusiness in the Struggle over Biotechnology" (2010). IWU Authors Bookshelf. 10.